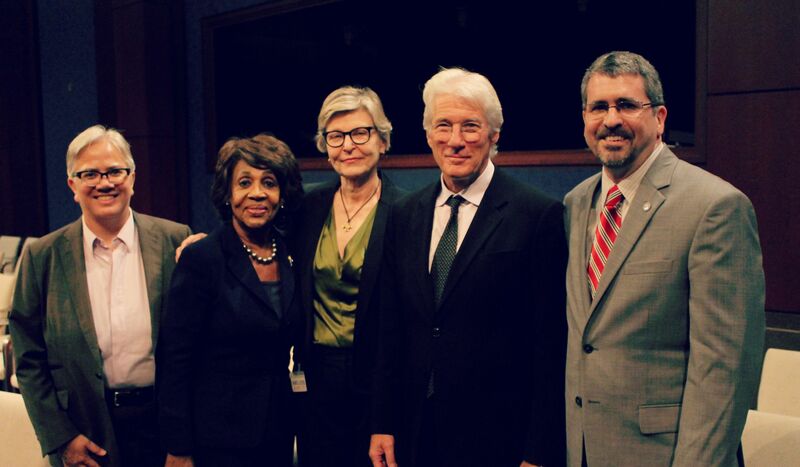 Congresswoman Maxine Waters (D-CA), Ranking Member of the Committee on Financial Services, hosted an in-depth discussion today with actor, activist, and philanthropist Richard Gere and a panel of policy experts on the state of homelessness in America, focusing on the need for additional resources, coordination, and attention to help prevent and end homelessness in America. In addition to Gere, the panel of homelessness policy experts included Nan Roman, President and CEO of the National Alliance to End Homelessness (NAEH); Matthew Doherty, Executive Director of the United States Interagency Council on Homelessness (USICH); and, Jennifer Ho, Senior Advisor on Housing and Services, United States Department of Housing and Urban Development (HUD). During the briefing, experts on the panel provided an update on the current status of efforts to address homelessness and called for Congress to work together to provide more support for homelessness assistance and affordable housing programs, which fuel local efforts to end homelessness in communities across the nation. Richard Gere, an award-winning actor and philanthropist who has worked on homelessness issues over the last 10 years, provided a powerful account of his recent experience playing a homeless man, and a particular scene where he panhandles on the streets of New York City. During this experience, Gere came to understand first-hand what it feels like to be ignored, disregarded, and left isolated and alone after standing on a corner for over 45 minutes. While homelessness overall has decreased in America, the City of Los Angeles, has experienced a 16 percent increase in homelessness across the Los Angeles Continuum of Care from 2013 to 2015. The number of chronically homeless persons in the Los Angeles region also increased dramatically – by 65 percent in just two years. And projections show that if funding isn’t increased at the federal, state, and local levels for Los Angeles, the rate of chronic homelessness could increase by another 40 percent through 2017. 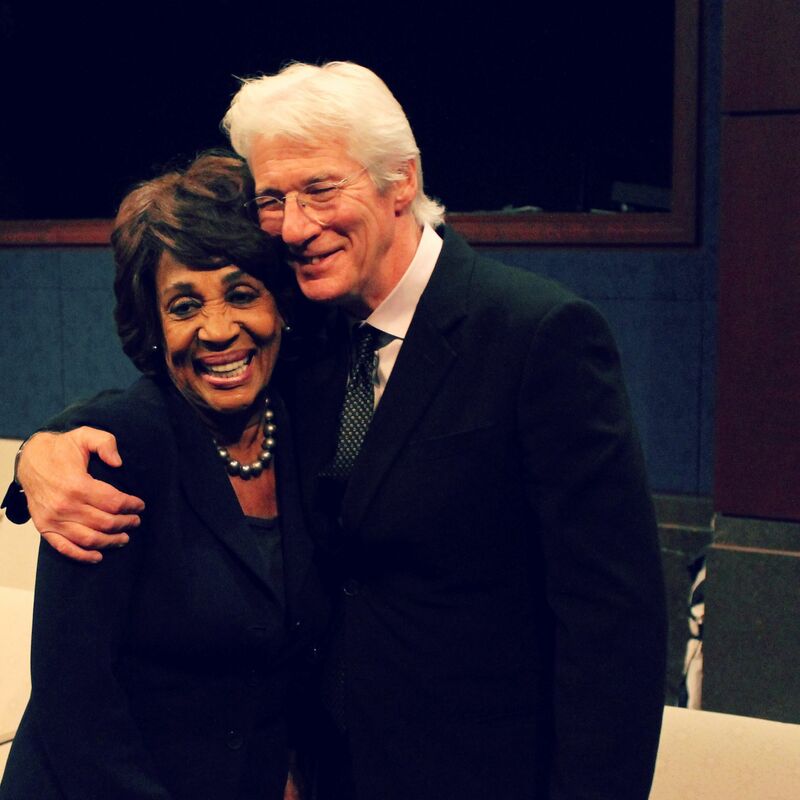 Congresswoman Maxine Waters moderating the briefing with Richard Gere. 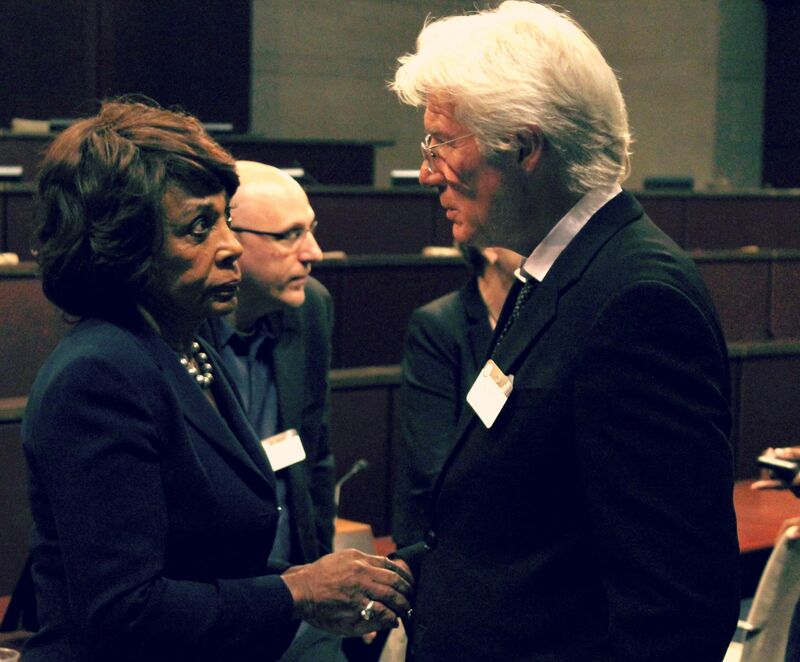 Congresswoman Waters discusses homelessness with Richard Gere. Congresswoman Maxine Waters with panelists Jennifer Ho, Senior Advisor on Housing and Services, United States Department of Housing and Urban Development (HUD); Nan Roman, President and CEO of the National Alliance to End Homelessness (NAEH); actor, activist, and philanthropist Richard Gere; and Matthew Doherty, Executive Director of the United States Interagency Council on Homelessness (USICH).